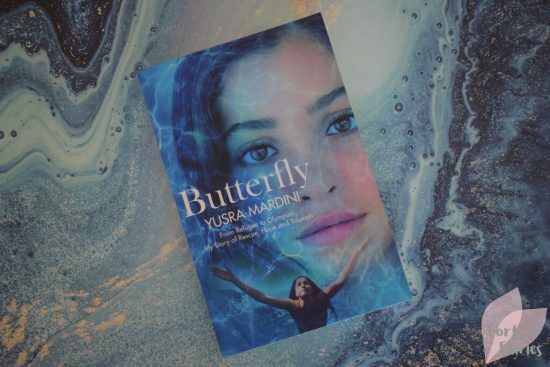 Butterfly is the story of Yusra Mardini, a young woman born in Syria who was forced to flee her country after war arrived on her doorstep at home. It’s a detailed account of the difficult journey she undertook to escape the city of Damascus and the harrowing events that unfolded as she travelled through Europe to Berlin. Yusra is a swimmer, and from a young age had her eyes firmly set on becoming an Olympian. She never lost sight of this ambitious goal, and overcame tremendous challenges to eventually be a member on the Refugee Olympic Team at the 2016 Olympic Games in Rio de Janeiro. The journey Yusra undertook with her sister Sara is an inspiring one, it was not only physically but emotionally demanding too. After fleeing to the Turkish coast the group of refugees boarded a small dinghy and set out for Greece. It wasn’t long before the boat’s engine cut out, however, and Yusra and her sister were among a few on board who pushed the boat for over three hours to reach the shore. As it turns out this was just the start of the determination and bravery Yusra would show on her journey to reach Germany. Butterfly provides incredible insight into the tragedies that are unfolding in countries stricken by war, and the lengths that refugees must go to in order to escape these atrocities and survive. It’s heartbreaking that any person would have to experience this, but even more so when you think of the elderly and young children who are innocently swept along in this unforgiving tide too. Despite all the loss and hardships Yusra faced, she refused to be defeated. Instead she used it to fuel her desire to show the rest of the world the plight being faced by refugees. We can only admire her choice to not be bitter or resentful but rather to be a beacon of light to others and to help educate us on what’s going on in the world around us. Butterfly is an inspirational and honest autobiographical story of an athlete who overcame all the odds to become one of People magazine’s twenty-five women changing the world, the youngest ever UNHCR Goodwill Ambassador and one of Time Magazine’s thirty most influential teens of 2016. Butterfly is available from book stores and online retailers for a recommended retail price of R310. Thanks to Pan Macmillan for sharing the inspirational story of Yusra with us.